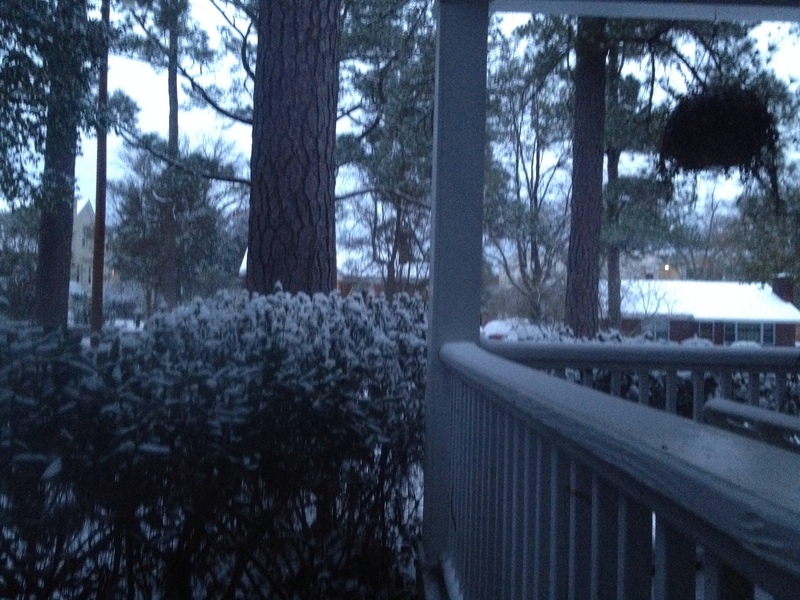 On Tuesday, here in Columbia, South Carolina, we began to batten down the proverbial hatches for Leon, the Snowpocalypse. Most children were out of school (though the weather didn’t start till after school time, Atlanta’s is a cautionary tale), the roads were treated, the university and the government were closed. Among those of us who gathered at work, diverse attitudes abounded. I was soon struck by the variety of responses to the same news, and realized that a bit of what we were experiencing was how each of us–where ever the impending ice-meggedon found us emotionally that morning–dealt with change and uncertainty. Of course, no sleep the night before, or a big deadline, or experience driving in snowy weather surely affected our outlooks as well, I was struck that the way we respond to small things may inform the way we respond to large uncertainties in life as well (then again, a death in the family and a possible snow day are rather different things). There were those who greeted the possibility as a gift–an unexpected opportunity for something different, an adventure, a change of pace, a tool to knock us out of the “norm” and into whatever the day or the weather might have in store for us. A few others of us looked at the sunshine, the empty, dry roads, and slivered our eyes, “Is there really weather coming?” we asked the skies. The existence of the storm was doubtful, its effect unproven. These folk were unimpressed-till-snowed-in; crossing the bridge if it happened to materialize out of the sunny skies, pragmatically focusing on the task at hand till then. Though there weren’t any in our offices yesterday, I suspect (judging from the empty OJ, milk, and bread shelves at supermarkets) that another significant group was gripped with fear of the unknown. Would it come? Would it not-come? What would happen? The anxiety of an uncertain future was debilitating, and so they busied themselves laying in supplies. For a Christian, there are bits of truth in each of these life-attitudes. We need not fear or be anxious about the future, but we ought to be wise as serpents, shrewd in our decisions and prepared for unexpected events (thinking of the virgins and their oil lamps). Of course, we ought not run about as a chicken sans-head; being so preoccupied with the unknowable possibilities of the future as to forget the task we’ve been set to here and now isn’t for the best interest of our earthly companions or for the glory of God’s kingdom. Finally, life is indeed a joyful adventure, though hopefully we can remember that when the weather (or a day) is unremarkable as well. This entry was posted in community, Who is God and tagged acceptance, fear, Joy, letting go, life, peace, relationships, skepticism by Emily. Bookmark the permalink.